The ability for a team to properly execute a neutral zone regroup can mean the difference between generating a scoring opportunity and giving up a scoring opportunity. In this video, we cover four basic neutral zone regroup tactics to help your team transition from the neutral zone to the offensive zone. Option #1: Post Up – Wings post up just inside the blue line along the wall for quick outlet options. Center curls strong-side for a secondary pass. This is a good option for less experienced teams, or teams with defensemen who don’t have strong puck-movement skills and ice vision. Option #2: Double Curl – The strong-side wing curls to the middle of the ice while the center curls toward the strong-side wall. The weak-side winger can post up for a tertiary outlet option. This option creates more offensive movement through the neutral zone, so defensemen need to have solid passing abilities, as they’re attempting to hit a cutting player instead of one at a stand-still. Option #3: Weak-Side Stretch – The strong-side wing posts-up, center curls strong-side. The weak-side wing starts up ice, then cuts back across the far blue line looking for a stretch pass outlet. This option requires defensemen with strong ice vision and passing abilities. Option #4: Strong-Side Stretch – The weak-side wing posts-up, center curls strong-side. The strong-side wing starts up ice, then cuts back across the far blue line looking for a stretch pass outlet. This option requires defensemen with strong ice vision and passing abilities. Killing off a penalty can be one of the most critical turning points of a game. Your team finally ices the puck, and you get a fresh set of legs on the ice to go pressure the opposing team while they’re setting up their breakout….now what? If you’re dealing with older players, it is important your players know their responsibilities and the lanes they’re defending. Forechecking efficiently is a must for any successful team today. Without an organized structure for attacking and regaining control of the puck, the team is vulnerable to quick breakouts, and will assuredly not be in proper position to play defense when the other team begins heading up ice. Before getting into the specifics of the 2-1-2 forecheck system, it is important to understand what type of play a forecheck is exactly. Many coaches believe the act of forechecking is an offensive tactic. I don’t believe this is an accurate description. While the forechecking described here outlines the pressure in the offensive zone, the key lies in the possession of the puck. I believe there are only three distinct scenarios regarding possession: 1) offense, 2) defense, 3) transition. In order for a player to be on “offense”, his/her team MUST have control of the puck. If the team does not have control of the puck, they are either in the transition phase or defense stage. The transition stage occurs during turn-overs while players shift from defense mode to offense mode (or vice-versa). A good rule of thumb is: if you don’t have possession of the puck, you’re playing defense. 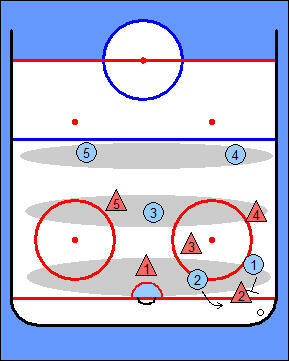 An offensive zone forechecking system is a defensive tactic to regain control of the puck. A well executed forechecking system will allow players to make quick transitions from defense to offense to create scoring opportunities. Most often an offensive zone forecheck will occur when the puck is dumped in. With that understanding of how to approach the pressure, let’s take a look at the 2-1-2. Player 1: The first player on the puck carrier should take the body (age permitting) to create a separation of the puck and the defending player. This player must have an active stick and actively take away passing lanes while pursuing the puck carrier. Player 2: The second player should ensure there is no D-to-D pass option for the puck carrier. Once player 1 has successfully taken the body and separated the defending player from the puck, player 2 should look to pick up the loose puck. Note: Player 1 can also share responsibility in eliminating the D-to-D outlet pass option depending on where he/she is coming from on the ice. With a 2-1-2 forecheck, the idea is to force the play to one side of the ice and not allow puck movement to the weak-side. Player 3: Player 3 plays a read-and-support role, staying in the middle of the ice in the high-slot. If defensive player 2 is able to make a pass to defensive player 4, player 3 would pressure player 4 to create a turn-over. If the puck is broken out, player 3 is in good position to backcheck. Players 4 & 5: The defensemen should play the point play as normal, reading the play as the defending player controls the puck and attacking players are attempting to force the play to one side of the ice. The 2-1-2 system is great to run when the opposing team has defensemen who are confident in skating the puck up the ice. Applying this type of pressure will take away their time and space to handle the puck. It also works well when opposing teams have slow defenders. Slow defensemen can be exploited by applying aggressive pressure. It is critical to have the first two players keep their feet moving through the entire process. When forecheckers hesitate using a 2-1-2, a good defense pair on the opposing team will use the extra second or two to find an outlet pass – usually D-to-D. Skate hard all the way through the forecheck. This article outlines one way to apply pressure, there are countless minor differences between implementations. Below are some animations to show examples of ways to apply this forecheck and rotations if the other team completes a breakout pass.